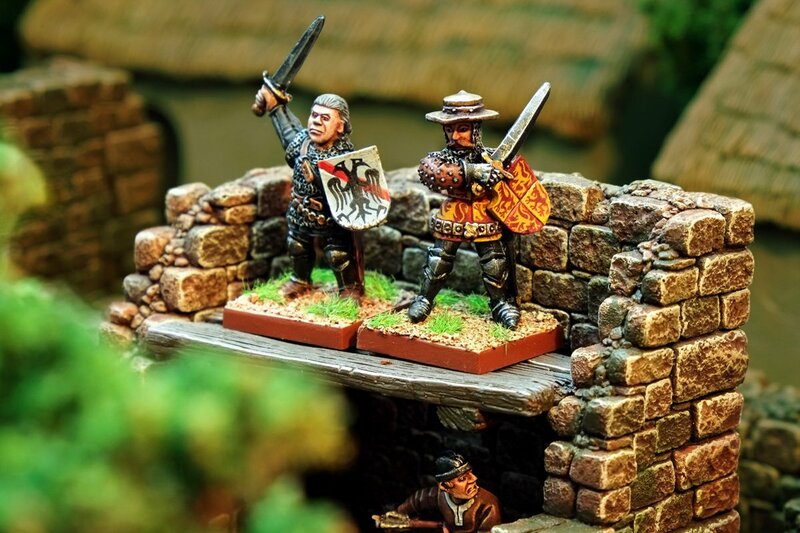 If you're into your medieval history you WILL NOT have heard of these models. That's cos they're not medieval at all. 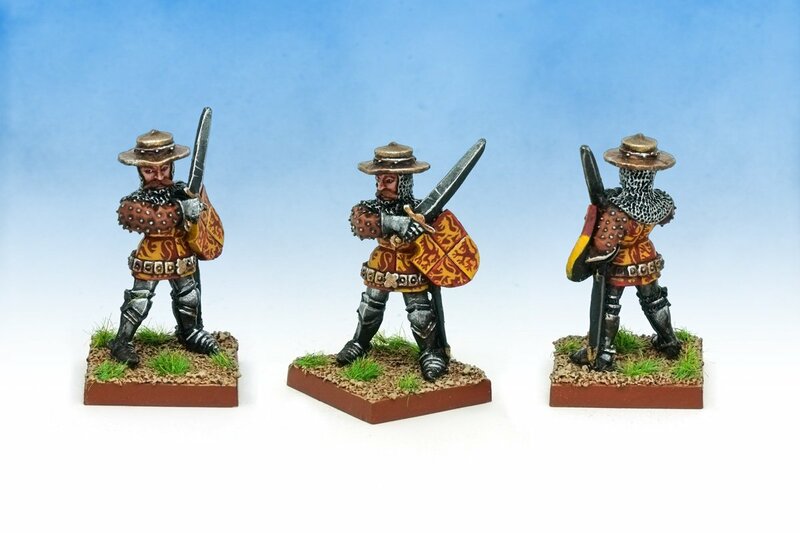 Welcome to my next two classic Citadel Miniatures from the range based on the 1987 Medieval Warlords book. 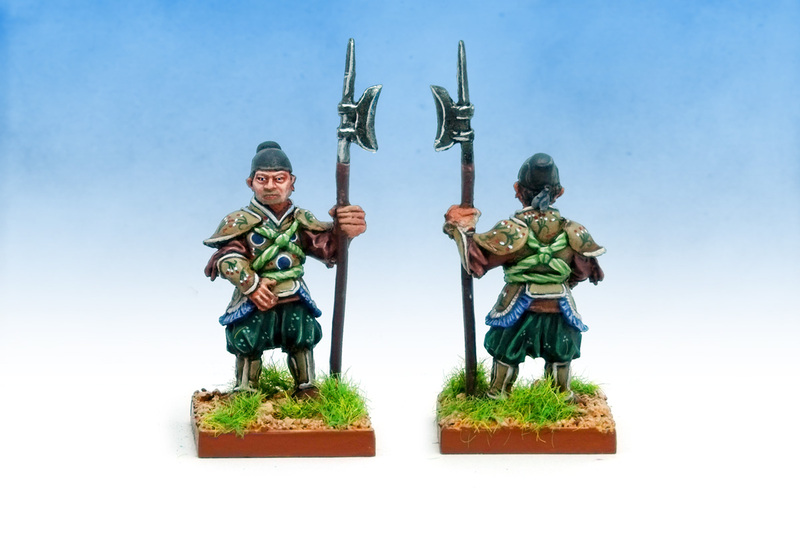 An Lushan and Imperial Guardsman on the lower reaches of the Yellow River. So, I have beef with An Lushan being classified as "Medieval" as it's a specifically European term for a historical period, and China ain't Europe. Calling An Lushan a Medieval Warlord is like calling Richard the Lionheart an Imperial Chinese Warlord. I imagine the publishers had a shortlist of even less suitable titles for the book. "Okay, sod it, we'll go with Medieval Warlords." 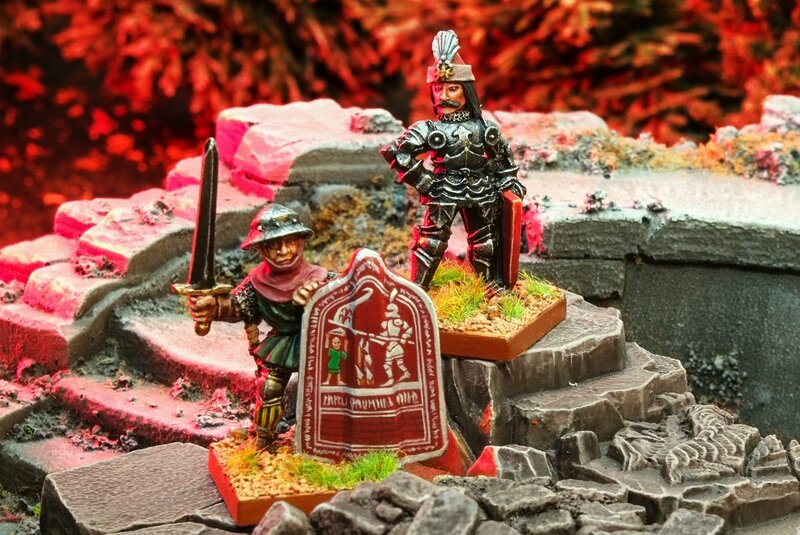 With the historian's pedantry out of the way, who are these two Medie... classic Citadel Miniatures? An Lushan was possibly Mongol. Possibly Turkish. Possibly Liverpudlian (going off the model's uncanny resemblence to Ringo Starr). 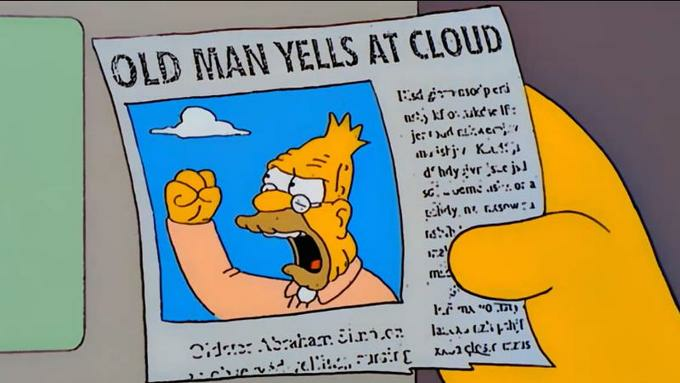 What we can definitely say is he wasn't Han Chinese as he was allowed to rise to power as a regional military governor in 8th century China when policy was to keep these powerful posts away from the capital's politicians to prevent rebellion. "In the town where I was born, lived a man who sailed to sea." However, in 755, An Lushan's previously amazing relationship with Tang Dynasty soured. He marched on the heartland cities and declared himself emperor of his own brand new dynasty. This was the An Lushan Rebellion, which was one of the bloodiest wars of all time – the Tang Empire was bigger than even the Roman Empire at its height, and the scale of slaughter as cities were toppled and populations massacred reached perhaps into the tens of millions. Fascinatingly, the rebellion seems to have been sparked not by lofty political ideals, or a popular dissatisfaction with the ruling elite, but by a concern (or possibly paranoia) that the Tang Dynasty's Chief Minister was personally out to get An Lushan. 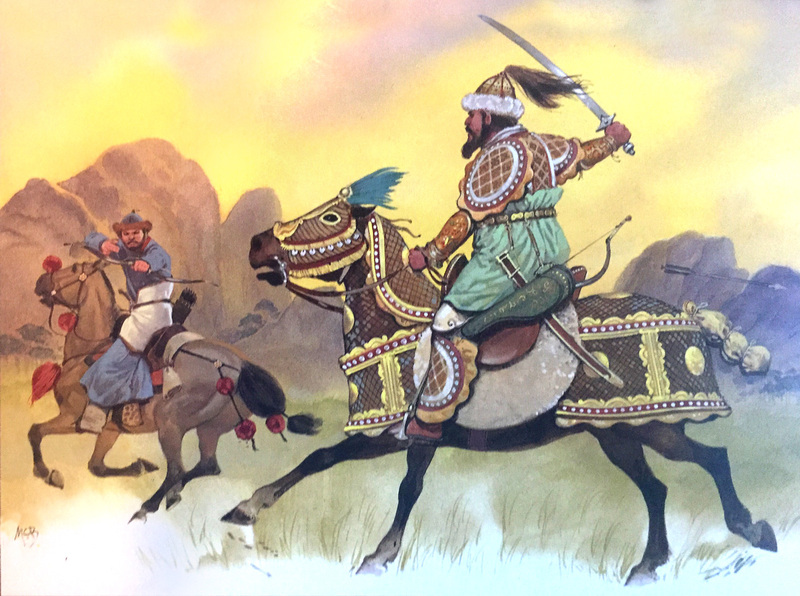 An Lushan pursues a Khitan Mongol beyond the Great Wall on the north-east Chinese border, 735. The Tang Emperor fled as the rebels stormed city after city. But as An Lushan's paranoia increased and his health worsened, he became a vulnerability and was assassinated by his own son (a surprisingly common fate in Imperial China). The Tang Dynasty was severely weakened by the uprising, and it marked the beginning of the end for China's golden age of civilisation. 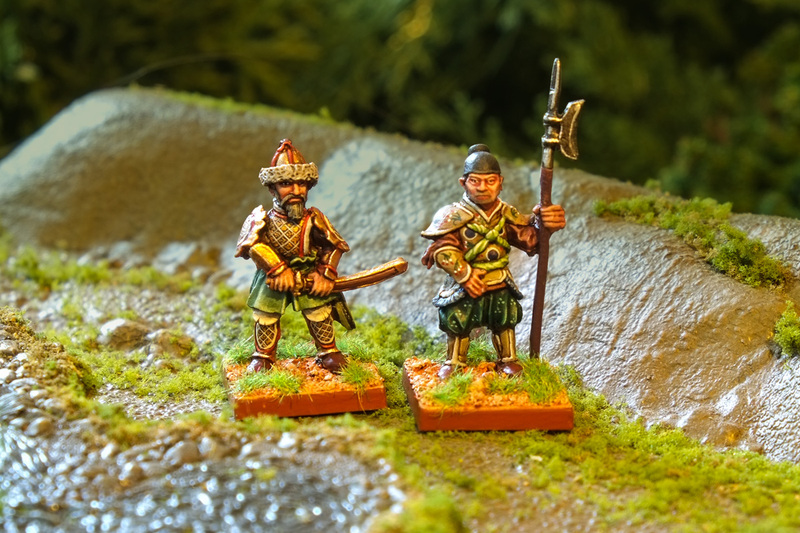 By the time of the An Lushan Rebellion, the Tang military was split between militia on the Empire's frontiers (which made up the bulk of An Lushan's forces), and the Imperial Guard who were permanently garrisoned at the capital city and the Imperial palaces. However, as with Ancient Rome's Praetorian Guard, an elite fighting force concentrated at the seat of Imperial power could lead to violent coups. Yang Guifei – the Emperor's consort – and the Imperial Guard prepare to leave Ch'ang-an before the army of An Lushan, 756. 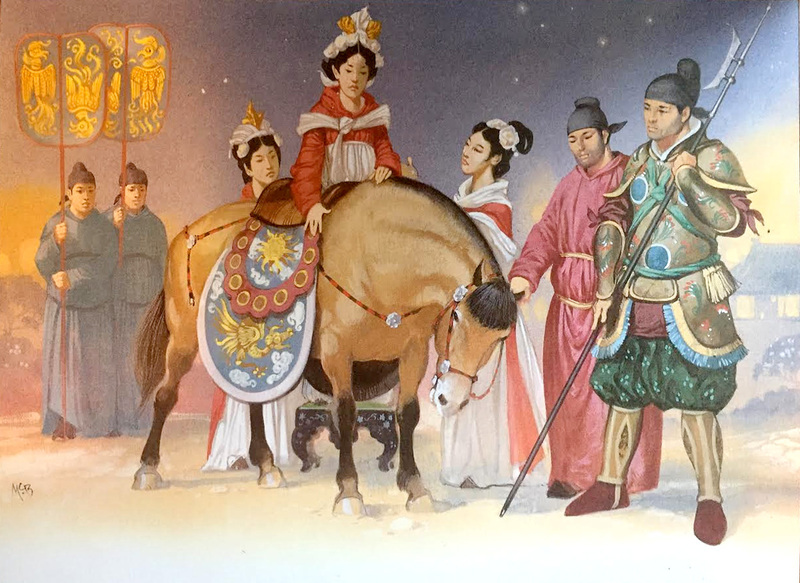 The Imperial Guard certainly proved wilful during Emperor Xuanzong's time – as they escorted Yang Guifei (the Emperor's favourite consort) away from the rebels' pillaging of the capital city they blamed her personally for their military misfortunes and demanded her immediate death. Needing to keep his elite guard on side, the Emperor consented and Yang Guifei was strangled. I've freehanded floral patterns onto the Imperial Guard's decorated leather armour to match the Angus McBride colour plates from the book. I enjoyed painting the stubble – all you've got to do for the five o'clock shadow look is shade and highlight the skin as normal then glaze the manly areas with a warm mid-grey (for example Skavenblight Dinge). So that's nine of the twelve Blandford Warriors painted. I'm enjoying the tour around history and the opportunity to dabble with different periods without having to collect dozens upon dozens of figures for gaming. 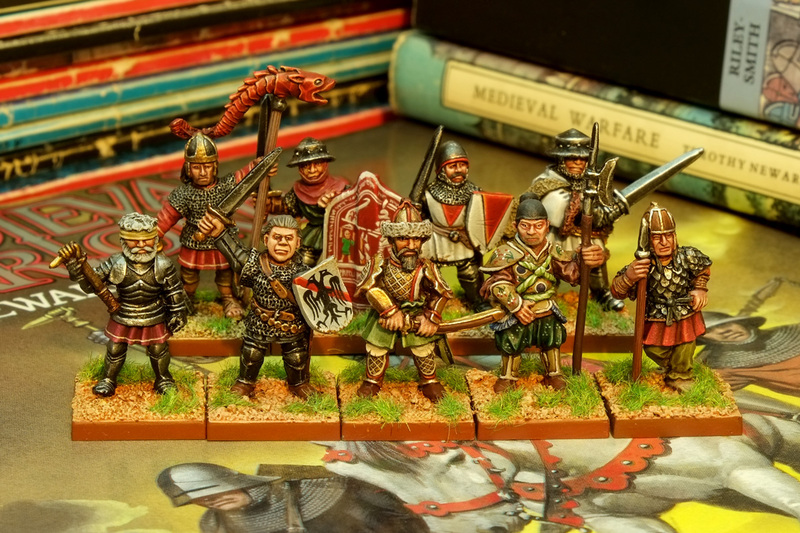 Left to right: Jan Žižka, Bucellarius of Majorian, Betrand du Guesclin, Taborite Infantryman, An Lushan, Sir John Chandos, Imperial Guardsmen, Teutonic Knight and Alan Horseman. 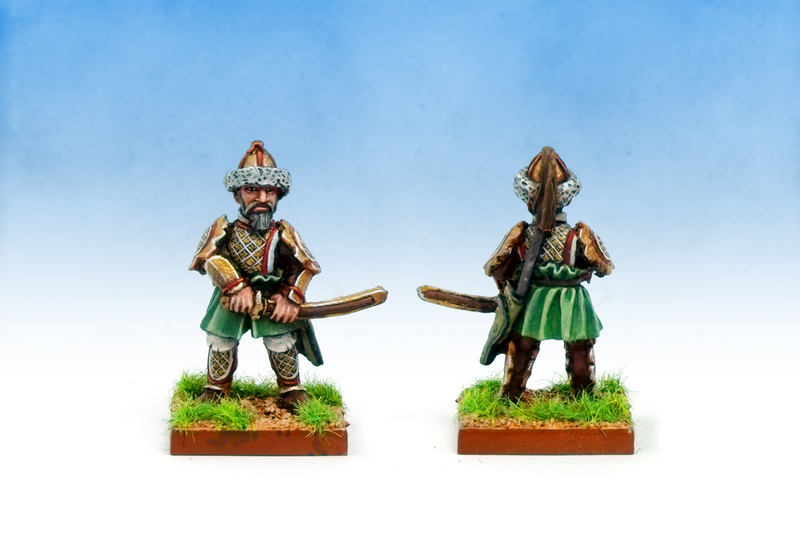 I'm looking forward to working on the final trio of Blandford Warriors to complete this historical wargaming project! It’s the end of the line for the Blandford Warriors! 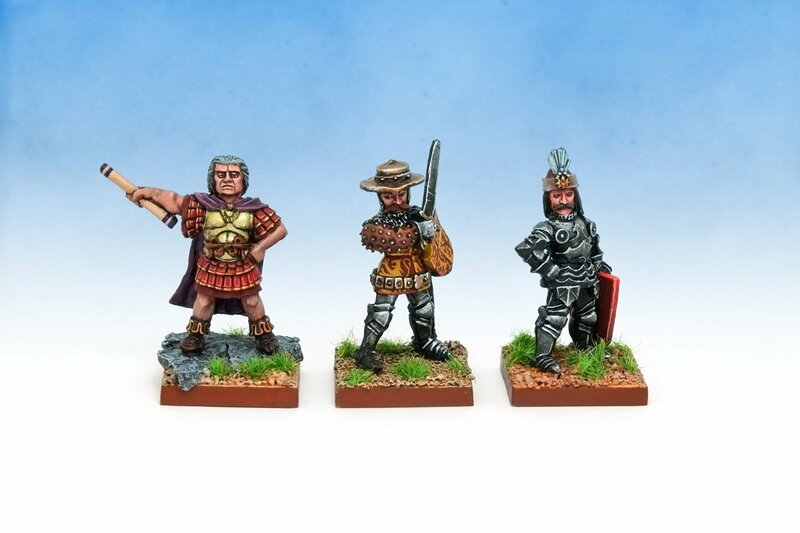 All twelve in this limited series of classic 1988 Citadel Miniatures are now painted and standing alongside each other in the cabinet, jostling for position of most dramatic medieval warlord. Left to right: Flavius Aetius, Owen of Wales and Vlad Dracula. The final triumverate are spread across a thousand years of European history. Let’s take a look at them each in turn. Chances are you’ve not heard of Aetius, but you’ll have heard of his most famous opponent – Attila the Hun. 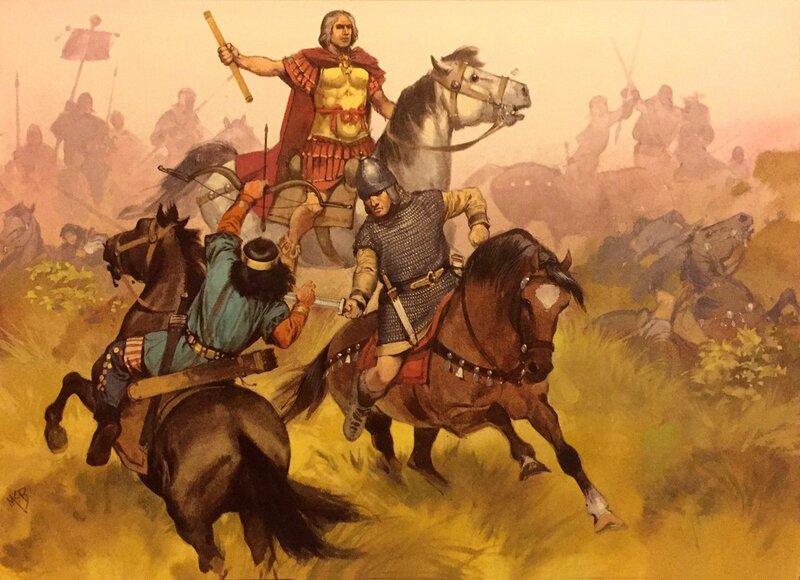 Aetius and Attila clashed at the Battle of the Catalaunian Plains in AD451 – one of the greatest bloodsheds as the Western Roman Empire crumbled under the weight of barbarian invaders. Aetius was supreme commander of all military forces in the west, and crushed the Huns, stopping their advance into Gaul, and ultimately breaking Atilla’s tribal empire – earning him a place in history as the last of the great Romans. 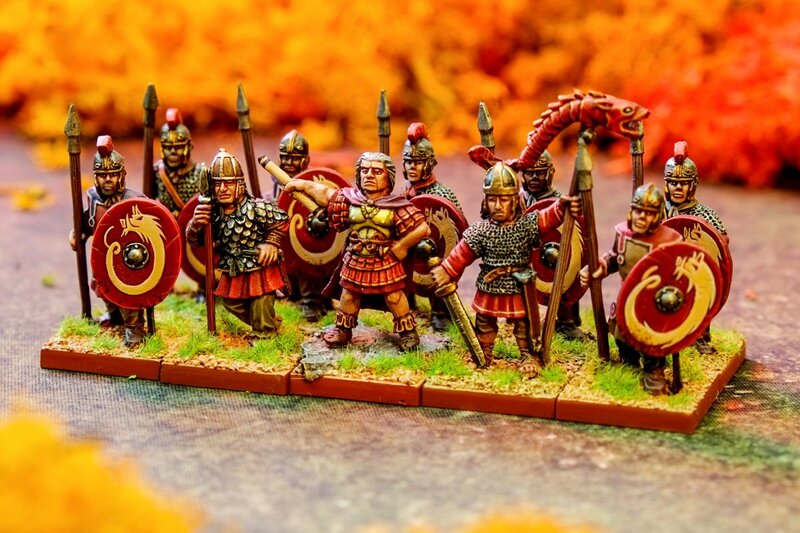 Flavius Aetius and his supporting Blandford Warriors – Alan Horseman and Bucellarius of Majorian – leading the defence of the Empire. I really enjoyed painting Aetius, and mounted him a small rocky outcrop so he cuts a commanding presence over my Late Imperial Roman. The mini is at least 20 years older than his rank-and-file counterparts, so he needs the height along the more modern, bigger figures. The Warlord Aetius and a Burgundian retainer attacked by a Hun at the Battle of the Catalaunian Plains, northwest France, AD451. Aetius has the unique honour of being the titular star of both a wargame AND an opera by Handel. The wargame is Aetius and Arthur (which must be 50% about him if you go off just the title). The opera is Ezio (that’s Italian for “Aetius”), and sees our general returning home from defeating Attila, trying to disentangle himself and his future wife from a plot to assassinate the Emperor. This is the only Citadel miniature I know of which has an opera about it, until my own work, Marneus Calgaro Maestro di Ultramarines, debuts this winter. This miniature is Owen of Wales (“Owain Lawgoch” if you’re Welsh), who was a mercenary captain in the Hundred Years War (c. 1330 – 1378). He hated the English so much he sided with their arch-nemesis, France, hoping his military service would ultimately help him claim the Prince of Wales title. He was killed by a sheep (well, an English spy named “Johnny Lamb”). 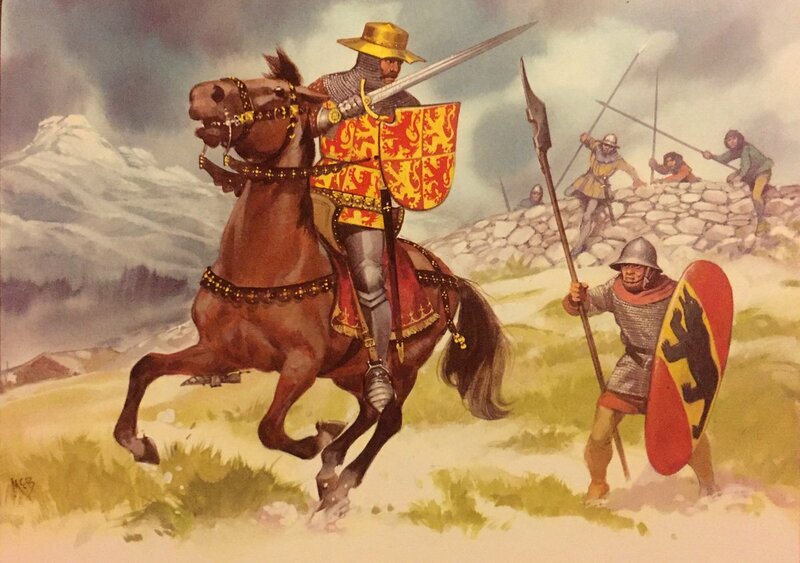 Bertrand du Guesclin and Owen of Wales fighting together, united in their hatred of the English. I had a load of fun painting all twelve of the lions rampant on his heraldry. They are the arms of the royal house of Gwynedd – which Owen would have worn to cement his image as the rightful Prince of Wales. Now, let’s all take a moment to reflect on the name of the Swiss municipality in the caption below. Owen of Wales is pursued by halberdiers from Berne at Buttisholz, Switzerland, 1375. 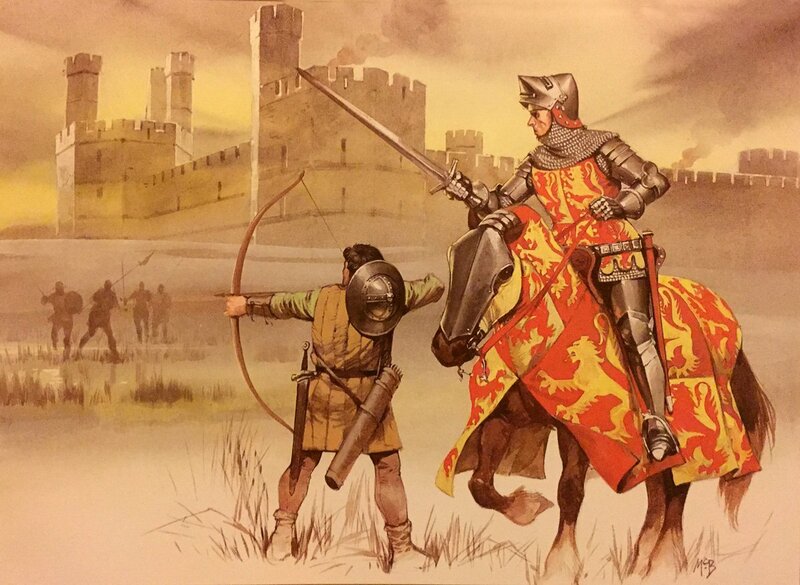 Owain Glyndŵr and his Welsh followers are attacked by the English garrison at Caernarfon Castle, AD1401. This later Owen pops ups in another Angus McBride illustration from Celtic Warriors that’s 83% more liontacular on account of that horse’s barding. That looks like an fun challenge to paint. Vlad Dracula, rose to power as Prince of Wallachia by impaling all the leading nobility on stakes in a single night and replacing them with a new totally-loyal nobility raised from the peasantry. He held on to power with the same impailment tactic – political enemies, suspected traitors, even whole armies of Turks found themselves with sharpened wooden stakes through their torsos. His brutality and violent excesses saw him dubbed “Vlad the Impaler” within his lifetime, and his legend has grown since his death to the point of him being the most iconic vampire in the modern popular imagination. Vlad was a member of the Ordo Draconis, which was founded by the King of Hungary to stamp out the enemies of Christianity (including the likes of fellow Blandford Warrior Jan Žižka). Though ostensibly Christian, Dracula never quite grasped the essence of the religion – attempting to demonstrate his faith to the King of Hungary with a gift of two bags of Turkish heads, ears and noses. See how well that gift goes down with your vicar. Dracula supervises the execution of prisoners after a raid on a German settlement in southern Transylvania, AD1460. The heraldry of the Ordo Draconis, in the Angus McBride plate above, is a dragon swooping down on some sort of serpentine monster. Ordo Draconis is where Dracula’s father – Vlad II Dracul – got his name from, and “Dracula” is the diminuitive form – “little dragon”. Dracula, looking every inch the **** of the town, though at 5’ 2” it’s not many inches. 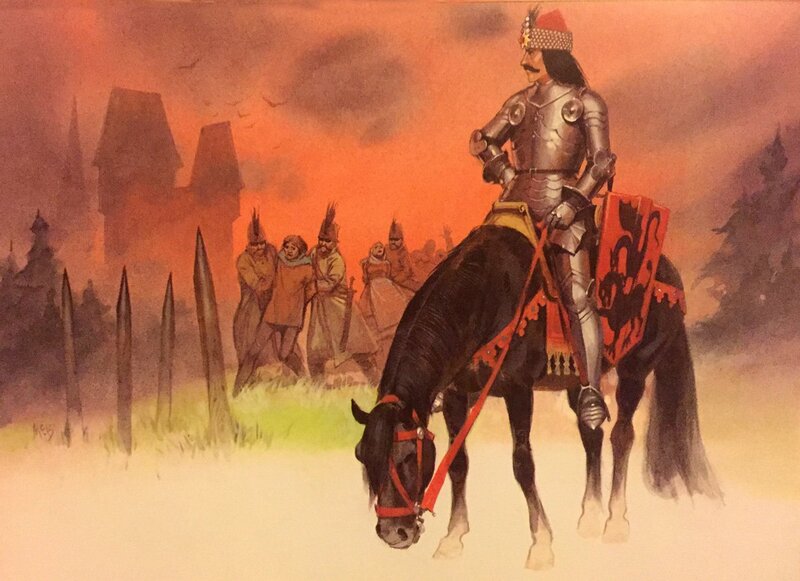 Vlad eventually died on the battlefield in AD1476, fighting the Ottoman Turks. They cut his head off and sent it to their Sultan, who impaled it on a spike. However, Vlad had converted from Greek Orthodoxy to Roman Catholicism during his lifetime – something considered so heretical that Wallachian folklore claimed that on death, any such heretic would transform into… a vampire. Could this be a dark horse on a dark horse? This casting was a gift from Marcus Ansell of Wargames Foundry (thanks Marcus). The tab (“GENERAL” and “ © GW 1987″) shows its provenance as a piece of classic Warhammer – but beyond that everything else is a mystery. Who sculpted it? What range was it destined for? Why was it not released? 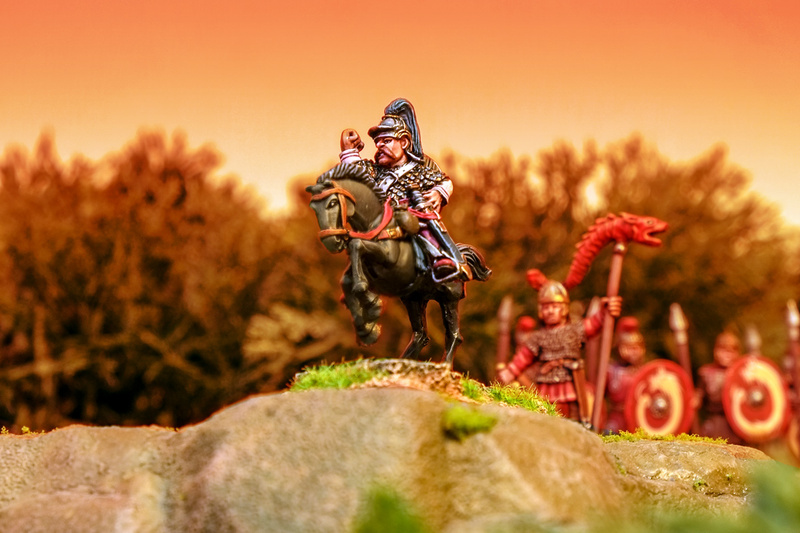 The vibe of the figure is more historical than fantastical – the moustache, crested helm and scalemail give it a very Romano-Germanic kingdom vibe. It feels like an Alan or Michael Perry sculpt judging by this face and care put into the armour detailing. In fact it’s a bit too historically accurate to fit in with Citadel’s F3 Barbarian or F6 Barbarian Raider ranges, or the ADD21 Advanced Dungeons & Dragons mounted barbarian. 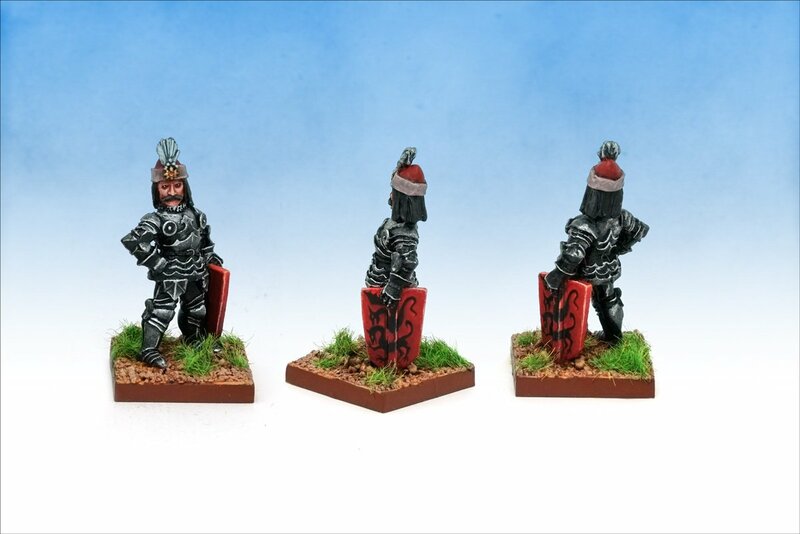 The closest thing released by Citadel are the F7 Mounted Barbarian Raiders. 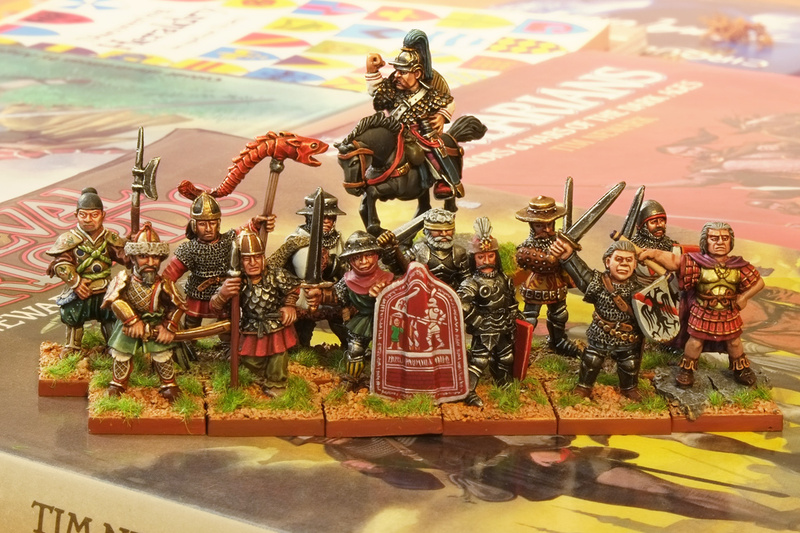 F7 Mounted Barbarian Raiders. Image from solegends. 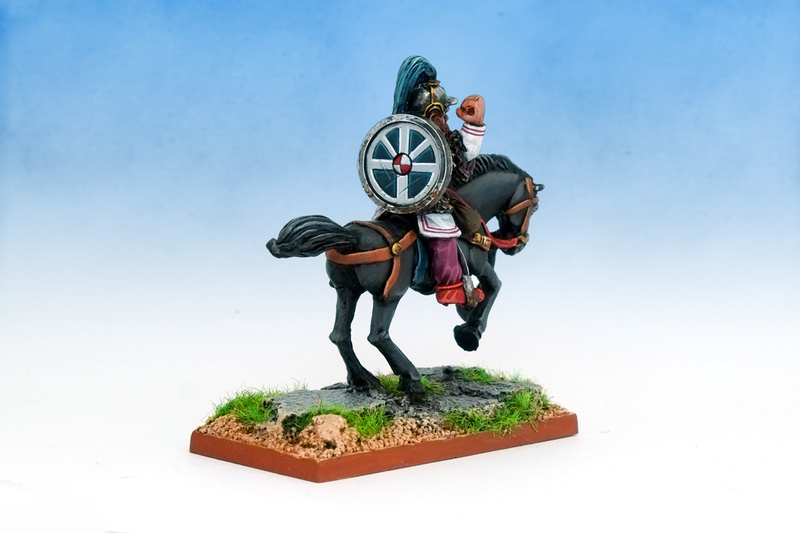 The Mounted Barbarian Raiders were released at a time when the line between historical and fantasy figures was blurred, with Warhammer’s Empire, Norse, Bretonnian and Dogs of War ranges doing double-service as various historical Europeans. It’s conceivable that Citadel had plans for a Warhammer race with a strong Romano-Germanic design elements, and this General was a testpiece. I gave my General one of the F7 horses as it’s coetaneous, and he deserves a bodyguard of these classics at a future point. I modelled the horse forward on the raised base so that when the planned regiment ranks up he will ride slightly above and ahead. Then as I was researching colours a thought struck me. Is this mystery figure a … Blandford Warrior? 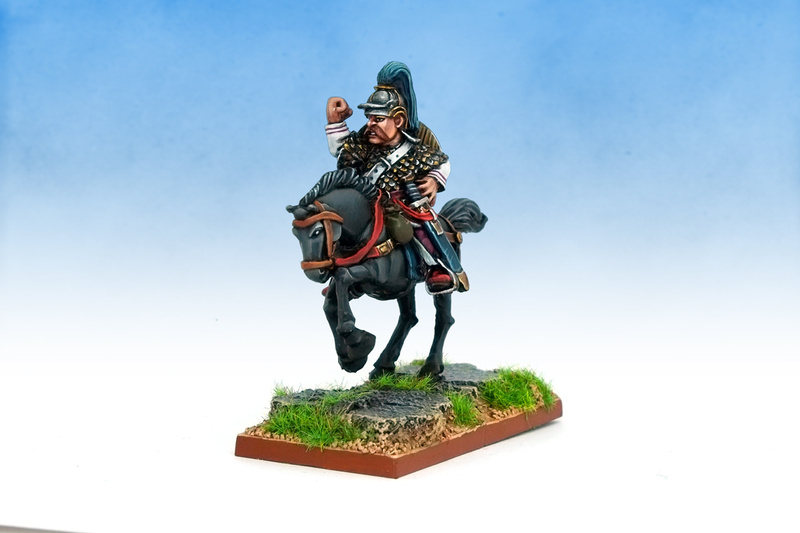 He fits beautifully with the released Blandford Warriors in terms of style and scale. The Medieval Warlords book comprises seven chapters each detailing a different warlord, and Games Workshop released miniatures for only six of these characters. The warlord that appears as a chapter but not a miniature was Genseric – general of one of the most famous Romano-Germanic kingdoms. I think this figure could be him. 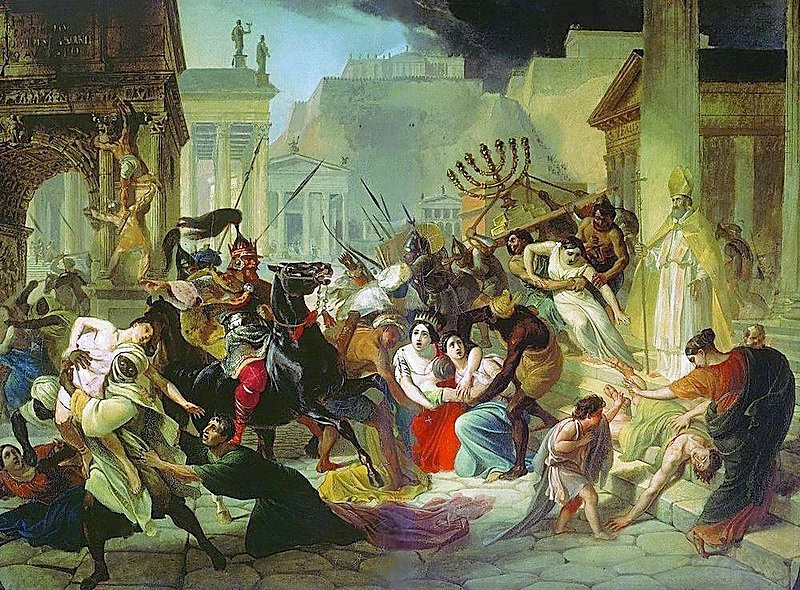 Genseric led the Vandals from the heartlands of the crumbling Roman Empire to Africa and around the Mediterranean region until they stormed Rome itself, looting its treaures. The incident stuck in the West’s poplar imagination, and ever since the word “vandal” has been a byword for destroying property. Genseric sacked Rome until politely asked to stop it by Pope Leo I, AD455. I used the Karl Briullov painting above as the basis for my miniature’s colour scheme. I love the satanically-black horse implying he’s the Pope’s archnemesis – but the menace is rather undermined by the pink leggings and ruby red shoes. Genseric and his bucellarius on the outskirts of Carthage. 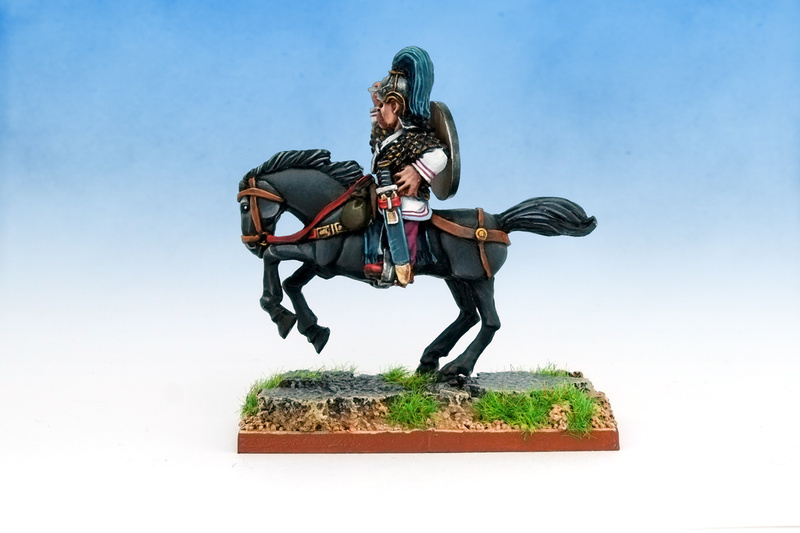 Regardless of the figure’s true identity, it’s now definitely part of my Late Imperial Roman army and will get some outings in SAGA when I’ve painted enough for a 4-point warband … coming soon. If you’ve got any theories or information on the figure, please please let me know in the comments. Last edited by Curis; 10-05-2018 at 09:59 AM.